John P. Cronan, Acting Assistant Attorney General, Criminal Division. I am writing you today as a flight attendant with American Airlines represented by the Association of Professional Flight Attendants (APFA) with the intent of filing a complaint. As you know, American Airlines merged with U.S. Airways in December of 2013. 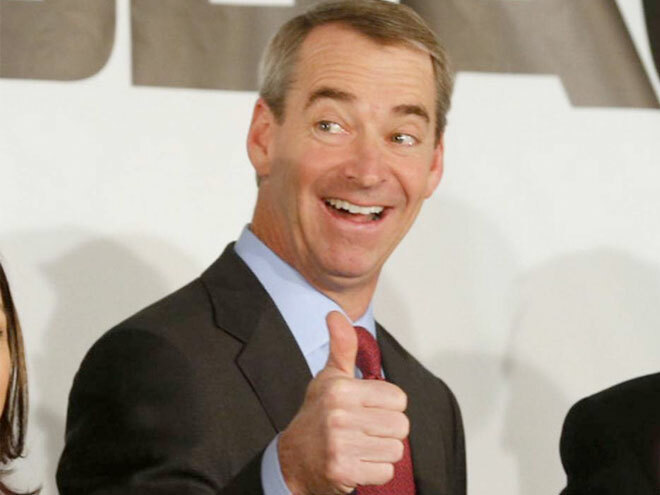 As part of that merger, APFA President Laura Glading agreed to an expedited negotiations process with U.S. Airways CEO Doug Parker to reach a single-carrier contract with the newly formed airline. That agreement, initially referred to as the "Bridge Agreement," was later called the Conditional Labor Agreement (CLA), and it outlined how the APFA would negotiate with the newly merged airline. In December of 2014 the CLA’s resulting tentative agreement failed to ratify because it fell short on the promises made by American’s newly elected chairman, Doug Parker. It was touted as being "industry leading," but fell far short of that mark. What flight attendants didn’t realize at the time was that the CLA was the result of a secret meeting hosted by U.S. Airways Treasurer Tom Weir at a restaurant in Manhattan. Why this matters is because Mr. Weir is Laura Glading’s cousin. The dinner meeting included Doug Parker, U.S. Airways President Scott Kirby, Tom Weir, Laura Glading, and two of Ms. Glading’s advisors. Why this is of importance is because Tom Horton, as president of AMR, was having merger talks with Doug Parker prior to AMR’s bankruptcy filing in November of 2011. These merger talks continued when Mr. Horton ascended to the position of CEO and continued even though Doug Parker was negotiating with American’s unions. The reason I’m contacting the DOJ is because I strongly believe that Tom Weir created a conflict of interest when he brokered a meeting that led to an agreement that placed fixed labor costs on American’s flight attendants by denying flight attendants the opportunity to negotiate a fair and equitable contract based on (1) American’s performance, and (2) competition in the open marketplace. In essence what Tom Weir did was guarantee Doug Parker that he would have the lowest flight attendant labor costs amongst his industry peers. As a result, Mr. Weir would witness the expansion of his own position as treasurer at U.S. Airways to that of treasurer at American Airlines Group — a company three times in size. It’s important to note that the CLA violated APFA’s union constitution because the Constitution mandates that APFA’s representational bargaining authority is between American Airlines flight attendants and their "employer." Laura Glading made an agreement with Doug Parker, the CEO of U.S. Airways, a non-employer, and therefore had no constitutional authority to do so. The CLA also violated the APFA Constitution because it (1) made changes to rates of pay, benefits and work rules, which required membership ratification, and (2) denied members the right to vote on changes to rates of pay, benefits and work rules that would take effect under the agreement reached through binding arbitration. This will be the second time in eleven years that American’s flight attendants have been denied the right to ratify their collective bargaining agreement — the first being in 2003. In summary, what I allege is that Tom Horton, Doug Parker, Scott Kirby, Tom Weir and Laura Glading created a form of price-fixing by setting fixed labor costs on American’s flight attendants by means other than traditional negotiations. They did this by deceiving the flight attendants at American by telling them repeatedly that they had no real choice in the matter other than to support Tom Horton’s reorganization offer for fear of a worse consequence if they didn’t. The tactic closely resembles "Boulwarism," only in this instance the company and union were BOTH promoting the take-it-or-leave-it option using the threat of a worse outcome if flight attendants said NO. This would be the third time American and APFA used this tactic on flight attendants — 2003, 2012 and 2014 — and in 2003 and 2014 the flight attendants were denied ratification. The last uninfluenced contract ratification was 2001. It wasn’t until after the failed ratification that American’s flight attendants truly became aware of Mr. Weir’s involvement or of his family relationship with Laura Glading. Had Mr. Horton and Mr. Parker discussed ticket prices, this would have been a clear cut violation of antitrust and would have led to a DOJ investigation and possible fines. Because it was labor costs, the issue seems to have gotten lost in translation. The question I ask is: How can two airline CEOs collaborate on ways to create fixed labor costs in an effort to undermine the competition and not discuss ways to set fixed ticket prices in an effort to do the same? American and APFA both initially asserted that the binding arbitration clause was meant to protect flight attendants in the event the company stalled at the negotiating table. As the voting commenced and members began questioning why the contract was far from being "industry leading," the company and union both began touting binding arbitration as a detriment rather than the protective layer it had been hailed as only weeks prior. They literally did a one-eighty! Now the company and union both claimed that a NO vote would guarantee flight attendants a contract valued at $81 million (42%) less than the contract that was negotiated. This is the only example I know of where arbitration led to significantly less wages than was offered by the employer originally. Apparently the company and union never envisioned a NO vote, and both felt that by using the threat of members getting less that this would motivate members into voting YES. When threats and intimidation failed, the company agreed to throw in the additional $81 million that both the company and union adamantly asserted would be lost due to a NO vote. This gesture was done simply because the company and union had no other option for cleaning up the mess. To rephrase, the constitutional violations that led members to a new contract would have been deemed moot once members ratified the end result. When ratification failed, the company and union scrambled to hide the fact that the members’ rights were trampled and hoped that no one noticed by offering flight attendants money that theoretically wasn’t negotiated. To make matters worse, American had to throw in an additional 4% because they realized that the 1/15/15 pay check was going to be virtually the same as the 12/15/14 pay check when the rise in benefit costs were factored in. Simply put, the raise would have been zilch and the members would have been angry. Knowing that this entire dilemma was the result of collusion and nepotism, the company and union faced a quagmire which could only be solved by offering flight attendants money that wasn’t negotiated. Oddly enough, the 4% raise only applied to unionized employees who had a new contract — the flight attendants — pilots, mechanics, ground workers and agents were without a new contract and got nothing. In twenty-five years with American, I’ve never seen management offer employees money that wasn’t negotiated. This was an absolute first. It is my firm belief that these collusive actions along with the violations to the members’ union constitution gave American an unfair cost advantage over United and Delta because they placed artificial labor costs on American’s flight attendants and forced them to accept a non-ratified contract for an unspecified duration while forcing United and Delta to have to compete with American’s flight attendant costs through traditional channels of negotiations. One could argue that Delta can impose wages and benefits as they see fit, but the argument to that would be that in doing so it would drive the members to organize — something Delta just doesn’t want. The fact that Delta flight attendants are nonunion — an anomaly in the industry — stems from the fact that Delta management pays their flight attendants above their unionized counterparts. Yes, Delta and American share similar wages. But this means nothing when we consider that a top wage Delta flight attendant received $9,000 in profit sharing whereas American’s top wage flight attendant received ZERO. (I should note here that Tom Horton gave flight attendants profit sharing as part of their reorganization contract (LBFO), but Laura Glading singlehandedly gave it away during her secret meetings with Doug Parker (again, a non-employer). It should be noted here that when flight attendants became aware of the collusion and nepotism that defrauded them of their Pension Contributions, Retiree Health Benefits and Profit Sharing they became enraged. The union’s board of directors, in an effort to quell the anger before it got out of control, asked Ms. Glading for her resignation. Ms. Glading then resigned from her position as union president and immediately retired from American. Flight attendants soon learned that the cozy relationship between Ms. Glading and Mr. Parker wasn’t over just yet. In an effort to thank Ms. Glading for her support for the merger (willingness to collude), Mr. Parker offered her a consultancy with the airline and allowed her to leave the company with a multi-million dollar retirement travel perk, one reserved for the top echelon of management: unlimited lifetime first-class positive-space travel her herself, spouse and dependant children. When flight attendants became aware of travel perk and consultancy offer, the union AGAIN stepped in to quell anger and promised members an "internal investigation" into the actions between Mr. Parker and Ms. Glading. To the flight attendants surprise, the internal investigation was quietly dismissed with no formal announcement coming from the union. Laura Glading is now working at the Federal Aviation Administration (FAA) as the "Director, Office of Labor and Employee Relations". In closure, I am calling on the DOJ to investigate whether the process by which the CLA and subsequent single-carrier contract were reached in violation of antitrust. While flight attendants are certainly excited about the historical success of the newly merged airline, that success should include them, not marginalize them by means of a strategy designed to place them at a complete disadvantage at the negotiating table — nepotism and collusion. * CEO Gerard Arpey hires bankruptcy counsel and then announces bankruptcy. * President Horton rises to Chairman as Gerard Arpey steps down and merger talks with Doug Parker continue. * U.S. Airways Treasurer Tom Weir arranges a dinner meeting between Laura Glading, Doug Parker and Scott Kirby at Oceana Restaurant in Manhattan. * At the meeting, Doug Parker and Laura Glading agree that Ms. Glading will accept Tom Horton’s reorganization proposal to the flight attendants as dictated, and also agree to expedited negotiations once Mr. Parker becomes CEO of American Airlines Group. They also agree that in the event of an impasse or failed ratification that the parties would submit to binding arbitration with the economic ceiling for the resulting contract to be placed at the "industry aggregate" of United Airlines and Delta Airlines and that the aggregate would be determined by the company. * Laura Glading accepts Tom Horton’s reorganization proposal as dictated telling flight attendants that if they vote NO that they’ll be forced to work under the 1113 Term Sheet. Ms. Glading then urges flight attendants to ratify Tom Horton’s offer based on alleged promises made by Doug Parker (a non-employer) that their losses would be recouped in a post-merger contract. * Flight attendants accept Tom Horton’s reorganization proposal referred to as the "Last, Best & Final Offer" (LBFO) because they’re told they have no choice other than the 1113 Term Sheet. * Laura Glading agrees to forgo profit sharing as part of the new contract in an agreement made with Doug Parker (a non-employer). * The pilots vote NO on their LBFO and go back to the negotiating table whereby they negotiate an enhanced offer — the LBBFO. * The flight attendants learn of the secret meeting hosted by Ms. Glading’s cousin, Tom Weir, by reading an interview with Ms. Glading in the Dallas News. * The flight attendants fail to ratify the tentative agreement reached through the process outlined in the CLA. * American tells flight attendants that they must go to binding arbitration even as the company extends negotiations with the pilots two times in an effort to avoid binding arbitration. * Binding arbitration delivers a contract valued at $81 million less than the contract offered by American. 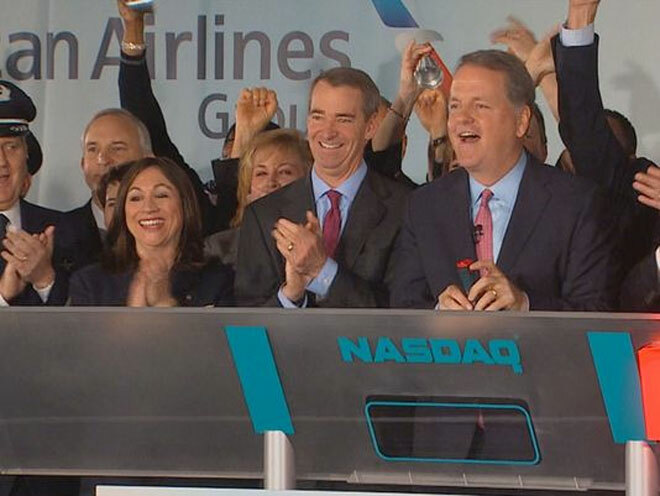 * Doug Parker agrees to give the flight attendants the $81 million. * Doug Parker offers an additional 4% wage increase to unionized employees with a new contract (just the flight attendants). * Flight attendants wonder how they could be so shortchanged in the face of historical profits. * Laura Glading is forced to resign when flight attendants learn of the collusion and nepotism that defrauded them. * American offers Laura Glading a consultancy with the airlines as a reward for the collusion. * American allows Ms. Glading to retire with a multi-million dollar corporate travel perk: unlimited lifetime positive-space first-class travel for herself, spouse and dependant children. * Laura Glading lands a job with the Federal Aviation Administration (FAA) as "Director, Office of Labor and Employee Relations"
Your prompt attention in this matter is most appreciated. The following helps to better explain the situation the flight attendants are dealing with at American as well as the actions that led up to it. American’s goal has long been to align the airline’s labor costs with those of low-cost carriers, it was never to turn the airline around or save the airline from bankruptcy. While American’s executives claimed to be on the "courthouse steps" in 2003, we know that the AMR Board never authorized a bankruptcy petition, therefore the airline’s executives were misrepresenting the airline’s true financial condition to both the airline’s shareholders as well as the airline’s employees, and they did so with a blind eye of the Board. That was the foundation of American’s 2003 Restructuring, which led to the RPA Lawsuit. (2) PENSION: The flight attendant pension plan was administered by an AMR subsidiary called American Beacon Advisors. The plan was grossly mismanaged to the point that American said that it couldn’t maintain it anymore and that it needed to be terminated. They tried dumping it on the PBGC but Josh Gotbaum said the company couldn’t because it was financing its own bankruptcy (Debtor in Possession). APFA was aware of the gross mismanagement by Beacon but allowed the mismanagement to continue. (3) SEVERANCE: The Department of Justice (DOJ) filed a lawsuit challenging AMR’s merger with US Airways and that lawsuit contained several objections, one of which was the severance package awarded the former CEO, Tom Horton. In short, the bankruptcy laws changed in 2008 because of the numerous bankruptcies, and this new law stated that the CEO of a bankrupt company could not be given severance that exceeded the lowest employee severance by more than 10 times. Simply put, the employee severance needed to be 10% that of the CEO. At issue here is the fact that Tom Horton was awarded $20 million by the AMR Board for which the DOJ objected citing the 2008 change in bankruptcy code. In the end, the DOJ settled with AMR and Tom Horton with a slot forfeiture at DCA and LGA and Mr. Horton’s severance was reduced to $17 million. The flight attendants got $40k severance to leave if they so chose. If we take the law at face value, the CEO was entitled to only $400k because of the 2008 law as applied to the flight attendants’ severance of $40k, meaning that the employees were entitled to 10% of what he received, which was $1.7 million. When I consider that the DOJ already outlined the lawsuit in their antitrust objection, it’s fair to say that a lawsuit challenging Tom Horton’s severance on the grounds that it exceeded the value allowed by law could lead to a hefty settlement. If I recall, 2,000 flight attendants left with $40k, and each of those 2,000 were entitled to more in my opinion because of the law. If we consider all those who were eligible to take the Early Out offer but opted not to because of the low $40k severance, there could be a subclass of plaintiffs that could claim that they would have taken the buyout had the company/union been honest about the CEO’s severance. Bringing the story up to 2011, American had been in negotiations with it’s three labor groups following the 2003 Restructuring and the company was procrastinating at the bargaining table. What took only weeks to give away now took years with no movement at the bargaining table. American was determined to get cost-neutral ("zero-sum") contracts with it’s unions so as to maintain the savings acquired by the 2003 Restructuring. In short, American cried broke to the point where investors lost interest in the airline’s stock and the stock plummeted causing a ten-fold spike in pilot retirements in the Fall of 2011. The pilots’ retirement package was tied to the airline’s stock price and pilots were losing more and more retirement funds each day. Ironically, the airline had almost $5 billion in cash and has just placed an order for 460 new airplanes — the largest order in aviation history — yet the company was claiming that it couldn’t compete and that it couldn’t offer new contracts that restored some of the 2003 concessions. American filed for bankruptcy simply to slow the hemorrhaging of pilots because there was no way to fill the vacancies in a timely fashion. Bankruptcy was the only option for the airline to hold onto its pilots. American bought a small piece of real estate in lower Manhattan so it could file for bankruptcy in the Southern District thus avoiding the Eastern District where the airline services two major airports: JFK and LGA. By the airline’s own account, American had been in talks with US Airways since April of 2011 — bankruptcy was filed in November of 2011. 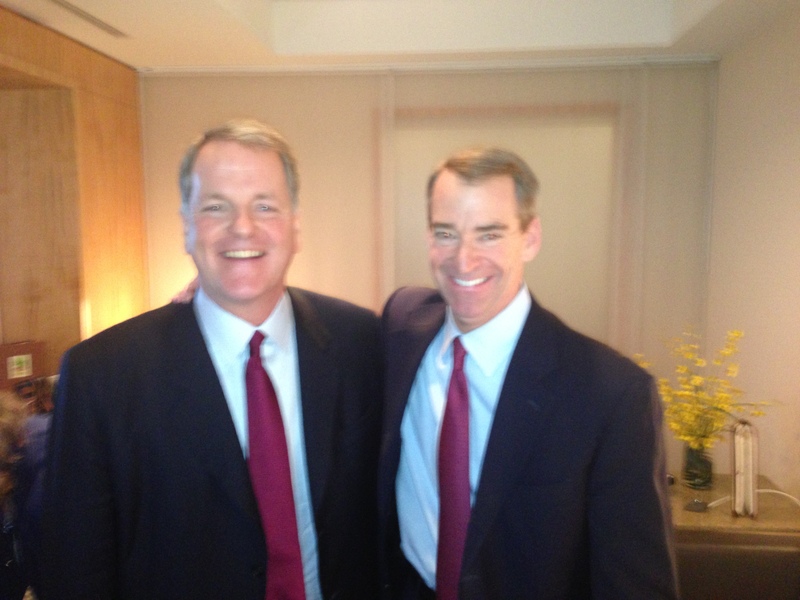 US Airways CEO Doug Parker and American’s president, Tom Horton, had discussed the idea of a merger on at least two occasions: (1) at an executive luncheon in Wyoming and (2) over breakfast in Washington D.C. (Horton had risen to CEO). 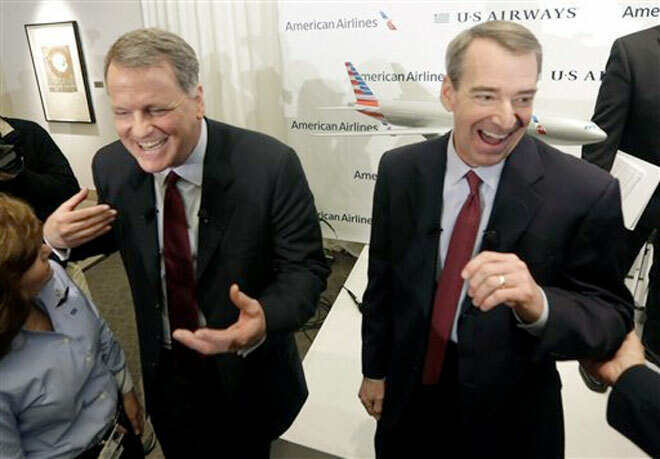 At the time of the D.C. Meeting, both airline’s PR machines were in full swing promoting the idea that US Airways was making a "hostile bid" for American and that if successful would result in job loss at American. This was to scare employees so as to make them more accepting. While all this was taking place, US Airways management was secretly meeting with union leadership. While we don’t know just how privy Tom Horton was to these meetings, we do believe that Tom Horton and Doug Parker were strategizing on how to put the two airlines together without raising labor costs and utilizing the strategy of good cop/bad cop so employees would be more willing to accept nothing in exchange for new management. Laura Glading stated repeatedly that employees needed "new management." We do know that Tom Horton and Doug Parker worked together in American’s finance department in the 1980s, and Mr. Horton has stated that the two are friends. Anyway, in the case of American’s flight attendants, it just so happened that the treasurer of US Airways, Tom Weir, was also a cousin to Laura Glading. Tom Weir hosted a dinner meeting in March of 2012 so that Laura Glading could sit down and discuss terms that would secure APFA’s support for a post-bankruptcy merger. The "hostile takeover" charade was transitioning itself to that of an "employee backed" effort to "oust" Tom Horton. Again, this charade was playing itself out while the two CEOs were having merger talks. Again, given the fact that American had almost $5 billion in cash entering bankruptcy and had just placed an order for 460 new airplanes, US Airways was in no position to buy American. To back up, the secret dinner meeting took place at Oceana Restaurant in Manhattan and the guests included US Airways CEO Doug Parker, US Airways President Scott Kirby, US Airways Treasurer Tom Weir, APFA President Laura Glading, APFA Attorney Rob Clayman and APFA Economist Dan Akins. None of the elected members of the APFA Negotiating Team were present nor did they have any knowledge of the secret dinner. Record of the dinner is noted in an interview Laura Glading had with a hired publicist, and that article found it’s way into the Fort-Worth Star-Telegram as well as a book written by Associated Press Contributor Ted Reed. The dinner’s expenditure is also noted in an LM-10 form submitted to the DOL. The terms for the post-merger flight attendant contract were outlined at the secret dinner meeting and those terms were finalized a month later at a secret meeting in Phoenix, AZ. The agreement was referred to as the "Bridge Agreement" and soon after the "Conditional Labor Agreement (CLA)." Again, none of the elected members of the APFA Negotiating Team were present nor did they have any knowledge of the secret meeting. Laura Glading refers to it as a "secret meeting" on video. When asked if the CLA needed membership ratification, APFA counsel responded by stating: "No. Under normal circumstances, an agreement such as the CLA would be sent to the membership for ratification. However, the CLA was reached in circumstances that were far from normal." The CLA also violated the members’ union constitution in that it was reached with a "non-employer." APFA’s representational bargaining authority is between APFA members and their "employer." Doug Parker was not an "employer." He was the CEO of another airline. In short, the CLA guaranteed Doug Parker that the merged airline’s flight attendant costs would be equal to or less than those of American’s two major competitors, United and Delta. I refer to this this price-fixing for employees because it allows American to gain an unfair advantage over the competition by having a labor agreement with it’s flight attendant union that utilizes an artificial cost structure rather than one reached through Section 6 negotiations in the open market. Southwest wasn’t included in the formula, even though American claims Southwest to be a direct competitor — the reason being is that their flight attendants are the highest paid. What Laura Glading essentially did was reach an agreement with a non-employer that hogtied APFA members at the bargaining table and gave them no recourse other than litigation. The CLA was later merged into a "Memo of Understanding (MOU)" in a post-merger environment, which then included flight attendants from US Airways who were represented by the Association of Flight Attendants (AFA). The MOU was founded on the terms reached between Laura Glading and Doug Parker, and AFA members were allowed to vote on whether to accept the CLA/MOU’s terms or reject them. In other words, not all members got to vote on the terms that would dictate the terms for negotiations. APFA members were considered outside "normal" while AFA members were inside "normal" even though they just ratified a new contract only months prior. The terms of the Bridge/CLA/MOU stated that upon exit from bankruptcy the airline and the APFA would negotiate a new contract in a matter of 60 days and that if the membership failed to ratify the new agreement, or if the company and union fail to reach an agreement, that "the parties shall immediately submit their dispute to final and binding interest arbitration. … for the purpose of achieving a joint collective bargaining agreement that is market- based in the aggregate." The "aggregate" included just Delta and United and the terms did not include profit sharing or a buyout as offered by both United and Delta. Where this story gets interesting is the fact that the parties did reach an agreement, but the members voted it down because it wasn’t "industry leading" like APFA had repeatedly stated it would be. 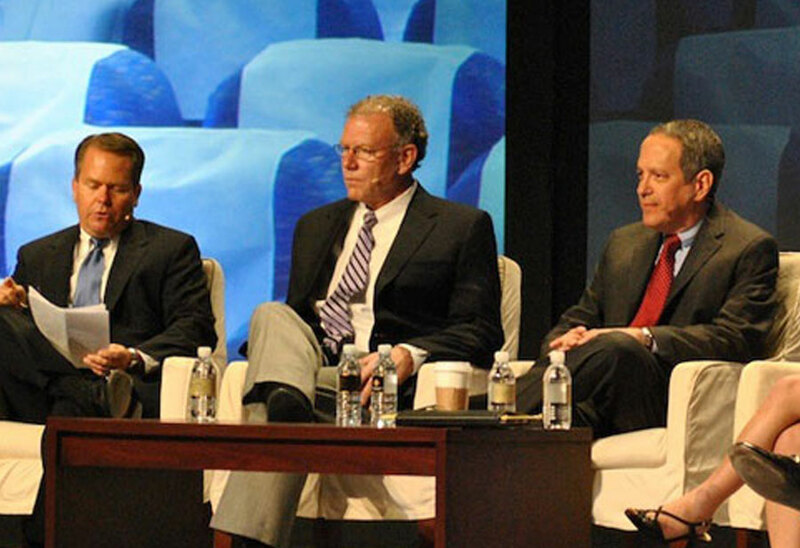 Once members began calling it paltry, APFA began calling it "industry average." 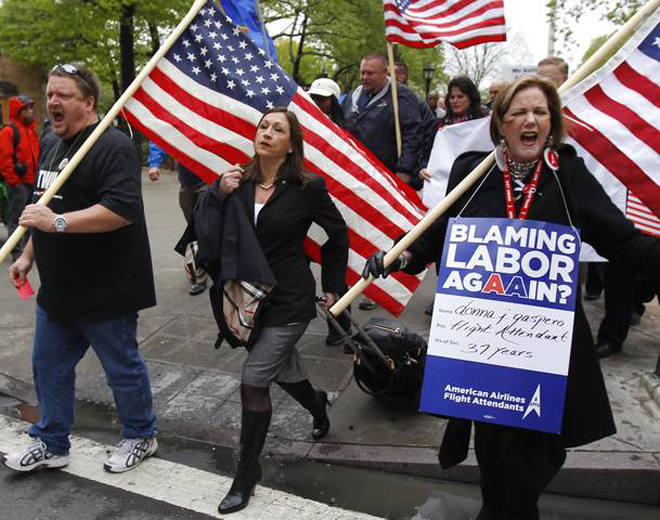 Once APFA realized that members weren’t biting, leadership began a campaign to scare flight attendants into supporting it based on the union’s own assertion that a NO vote would deliver a contract that was valued at $82 million less in binding arbitration even though they touted binding arbitration as a safety net against getting an unfair contract. The agreement was valued at $193 million in annual gains whereby $82 million represented a value "above the aggregate." Flight attendants were given no cost breakdown or valuations regarding the contract so as to make any mathematical comparisons, and when members asked what the valuations were they were told that "the union doesn’t disclose that sort of information." What we do know is this: the company claimed that of the $195 in annual concessions reached in bankruptcy from $16,000 American flight attendants, 24,000 combined flight attendants were now going to be sharing $193 million in annual returns. There was no value given to the freezing of the frozen Defined Benefit Plan or the forfeiture of prefunded Retiree Medical Benefits. During bankruptcy, American agreed to give flight attendants a "match" to their prefunding return but then later reneged citing that the match was contingent on American successfully terminating the Retiree Medical for those already retired. In other words, APFA chose to throw retired members under the bus in order to give active members money that wasn’t rightfully theirs. I should note here that even though the company/union agreed to a "$3,000 signing bonus" for 8,000 US Airways flight attendants to secure the vote, the agreement failed to ratify by 16 votes. "Working off of the CBAs they ratified in bankruptcy, APA and TWU chose to negotiate with US Airways for full agreements that will take effect once American emerges from bankruptcy and certain other conditions are satisfied. We chose, instead, to negotiate a transitional agreement — the Bridge Agreement (CLA) — that replaces the LBFO and allows us to negotiate with the New American, on an expedited basis, for a full contract. That was the best path for FAs." I remember this fiasco when I took the buyout.. I knew we were cheated. I wish I had stayed in case this will ever be fought. It is probably late in the game to fight it now. I remember Rock Solomon and I admired him and his efforts. I have friends at Delta and they always had a much better deal than us. They get huge bonuses. It is a shame that we always kept quiet and let these things happen. Why could the AA flight attendants be subjected to this illegal behavior without consequences to the perpetrators?? Sad thing is their doing the same BS to the customer service group. I do believe they have contacted the same attorney for assistance I think the two groups together would be much stronger. I can put you in touch with the right person. Pls, count me in. Thank you. Flight attendant were always fighter and we’ve been treated like a dirty rug for to long. LET US DO THIS!!!!!! I’ve been with AA for 24yrs and from day one they have been lying to us. It would be nice to have respect for us flight attendants once and for all. Back in Mr. Crandall days it was a little better. We need to stop these groups going forward, they need to be taken out and place them with hard working people for us the flight attendant. Rock I just hope that with this article that you put out that we knew about long time and all the responses it would make the DOJ really take matter in their hands so that we could see justice. I thank you very much Rock and please consider again taking that position., president of our union. Rock for APFA. You Qualify for a 72.5% Subsidy for your Health Insurance! Go to our webpage for the WebEx link and audio passcode! This is a clear violation of conduct,whereas negotiations was taking place with a non employee so as to set him up for the take over of the airline. This information should go before a judge where charges would be placed upon said persons. J Am NOT A Flight Attendant But I Am A TWU Ramp Employee And I know non of the unions got a fair deal. The company is doing soo much internal confusion, tuning to manipulate the employees to think they got the best contract in the airline industry. However all.the big management were getting bonuses and raises while our benefits and salary were being reduced to nothing. Right now I know I am working at a 2001 salary only ,if you consider the benefits that has to be paid to cover medical and dental then 1.09$ is NOT going to cover that…ever. We need to be making money like deltas employees even though they are non union so we can meet airline industry standards. Oh by the way I know it was mentioned already but southwest airline could not be included because their employees were making too much money and that could not work for our airline. Henceforth a case should be presented to a judge according to the news, united Airlines were in a similar situation (meetings that they had together with other people) and the ceo had to step down. Let’s take this to the next level. I will certainly share this with my twu union employees. This is certainly an injustice and once again the greed of corporate America taken out on its workers in an unfair unbalanced way. I only pray the DOJ will really investigate all of this and see the injustice that was done and changes it to our benefit for once and for all. I am living this Heist and deceitful representatives…it’s horrible feeling to work for such a group of disappointment. How sad.. Great information.. Please keep fighting. If an injustice has occurred someone should be changed and penalties should follow. Rock, apparently your impression of who’s really running APFA is right in line with many of the FAs at old US Airways also. Can you just imagine the strength the FAs could have at the NEW American Airlines “if” they joined forces — and got new Union Leaders that would truly represent ALL of the FAs. On a side note, I can’t wait until that term, “legacy”, is dropped once and for all. The term continues to be used as a means to keep us divided and often, I feel, that is exactly what they are trying to do — keep up divided and at odds amongst ourselves. The strength we could have if we all stood together would be amazing! I’m hoping that one day (hopefully, sooner than later) we will experience that. In the meantime, your article is excellent! Thank you for the time & effort you put into it. The flight attendants at American had the chance to get rid of the APFA, and, they voted it down. They knew that they had been screwed by them in 2003. But, God forbid they could make a change when they had the opportunity, and go with a National Union where the collusion between union and management would be much less of an opportunity. This has been going on for years at AA, from what I’ve heard of past goings on before 2001 even. I want to thank Rock for his endless fight. You ROCK Rock! AMAZING !!! !LETS TAKE ACTION INDEED … I AM FED UP OF THE ABUSE AND UNJUSTICE OF THESE CEOS AND CORRUPTED UNION REPRESENTATIVES THAT WE HAVE BEEN DEALING FOR THE LONGEST TIME…THEY HAVE AND KEEP DECIVING US, CHEATED ON US…IT IS TIME FOR A CHANGE.. LETS WORK TOGETHER!! Wake up America corporations are robbing us blind. Stand up and take your ground and fight for what it’s fair. I’m so disappointed in our Union which have allowed our employer to cheat us of profit record sharing monies. living in a nightmare. We put our money and trust in a union that keeps stabbing us in the back. This is the second FA union case referred to the DOJ in just a few months. IAM recently filed for a FA election at Delta, but after discovering many fraudulent cards, IAM withdrew the application, and the NMB referred the case to the DOJ. A HUGE blow to IAM (and union) credibility at Delta. This article hits home and everyone needs to open up their eyes and see corruption is everywhere within this Company and our Union. Seeing this in print how our livelihood, pension and once a great airline has been destroyed by greed is devastating. We were forced to vote on a contract with no benefits to the employees, but many to the company and our APFA union. We went into bankruptcies for restructuring and now that AA is making Billions in profit quarterly, management and our union have a very short memory. It’s time our voices are heard. I would like to know how can I support this cause. I am in MIA and very willing to help. I have written to the BOD’s, DP, Laura, etc but never had a response. “There seems to me to be a clear assertion of a RICO violation…..Conspiracy. We have been robbed, cheated, abused, and taken for granted for many years now. It’s saddening and embarrassing to be treated this way when our competitor’s flight attendants that don’t even have a union received thousands of dollars in profit sharing. Our union leader, our CEO, and everyone involved in this heist deserve a one way trip to jail due to their ulterior motives! Excellent letter and we need to go a lot further quickly with all of this.I’m in. Where do we go from here? You guys are all delusional. Nothing will happen. NOTHING. They made $1.2 BILLON last quarter. Nuff said. Think they care what you or I think? NOT….. Thank you Rock for such a well written account on how we have gotten to this point. I truly hope that we can finally see justice. Thank you Rock for not letting this go! It’s been so many years of abuse to a work force that gives so much each and every trip. The leadership at this union has been robbing the membership since 2003 they all need to be put in jail . Investigation is necessary! With two contracts imposed on flight attendants within the last 11 years, and record breaking profits, AA executives continue to line their pockets at the expense of the flight attendants. Laura Glading had no authority to represent her peers in negotiations with non-employee, Doug Parker. At obviously, the meeting set up by her relative was a conflict of interest for the group she was supposed to represent! I respectfully request that the DOJ investigate. When collusion and secret deals are allowed to transpire to circumnavigate the open, transparent and accepted negotiation process. Not only does this place one workforce at a disadvantage, but lack of an investigation by the DOJ would serve to rubber stamp creative methods for corporations to get around fairness in future dealings as well. Please look into this. Very sad what has happened. After more than 40yrs with this company, the devastating impact this new Senior Management and the Union leadership,have brought to is employees and the membership needs to be investigated by the DOJ. It saddens me to read what we already have known and nothing has been done about it. I beg the doj look into this. we are earning the same wages as we were almost two decades ago when the company profited much less. i truly believe this corruption is deeply embedded in the false bankruptcy and the criminal actions of the board, the executives and the union. Sadly enough, it is all true. Thank you Rock for bringing the facts to light. This article is spot on. Seeing in print how my livelihood, pension and once great airline has been vandalised by greed is heartbreaking. My sincere hope is the DOJ takes a long hard look at this injustice. After I read this article I couldn’t have felt more upset about how corporate greed ruins lives of hard working employees. We all know it exists but this is morally wrong. The DOJ really needs to look at this, imposed contracts and no voice left to the membership is not the way a Union works. After voting down this imposed contract, which is no contract (so many “to be determined” phrases) All I see is corruption everywhere. Rules not being followed etc… This is NOT the company I started with 25 yrs ago. And I have another 15 yrs to go. I don’t understand how this was allowed to happen. Very disillusioned. It is a travesty that we were forced to vote on a contract with no real benefit to the employees. The contract was simply a shell game where money was moved around to appear as if we were all receiving large pay increases. Unfortunately when you start subtracting higher medical it ends up just being a wash. This at a time when AA is making billions in profit quarterly. We were certainly all in the same boat during the the lean times and bankruptcies and expected to give up salaries to maintain the company. Now that times are good, management has a very short memory. Not only is this quagmire unethetical but it looks like perhaps illegal also. I hope this petition is taken seriously and looked into. Employees are an asset that deserve to be treated honestly and fairly. Because of the continued shenanigans between AA and APFA, I was forced into an early retirement. I had planned on working another ten years. However, this little arrangement made between Laura Glading and at the time, an outside employer, just ruined the “career” of many. Hoping the DOJ gets to the bottom of the corruption. APFA acts like a company union. Never did we expect to work under a contract that was voted down. It also appears Laura Glading colluded and overstepped the boundaries of a union president. The irregularities are glaringly evident and worthy of investigation. As an employee with American Airlines for 38 years, and a former friend of Laura Glading – who’s bright mind and dedication I once greatly admired – it saddens me to read the above and know that much of it is true. I retired 4 years ago, just ahead of the bankruptcy, because I no longer experienced the same loyalty I once felt for American, and because I felt a growing bitterness; I was nothing more than a pawn in a game I had no control over – a game that was my career! I thought by retiring I would get a healthier prospective on life and enjoy the pension that I had worked for almost 4 decades to provide. American is now chipping away at the benefits that I had earned, and my retirement is now not what was promised, nor envisioned. I feel great empathy for working flight attendants at American Airlines. I am proud that they continue to fight the corruption, and fervently believe that the Department of Justice will right this imbalance. I am very sad to read in print what I already knew to be the truth. Sometimes being right just feels so wrong! I’m saddened to see that our once proud profession has slowly been eroded through the years. The founding fathers /mothers of this profession must be rolling over in their graves. When is ENOUGH IS GONNA BE ENOUGH?? When are we going to get this Union Busting administration OUT??? Laura Glading has set the labor movement decades! This is not ok, the rich get richer the poor get poorer and the middle class gets erased> This all smells of corruption and the DOL, DOJ, ET. AL. NEED TO START INVESTIGATING. We have been robbed of our livelihoods and it’s ok with the misinformed and the ones that drank the Kool Aid?? INVESTIGATE NOW! WE HAVE BEEN ROBBED AND NOTHING IS BEING DONE ABOUT IT! Truer words were never spoken. DOJ please intervene and investigate AAL/APFA. Follow the money, i.e. stock options and equity shares. Our union could have negotiated during binding arbitration, but instead decided to sign and agree with the same agreement that was voted down. This is another example of collusion by APFA and American Airlines. I was deeply saddened in reading the above and can feel the utter despair and disappointment felt by F/As if this is indeed how events took place. A slight majority of us have seen the corrupt nature for quite some time. It’s sad we pay them to destroy our careers. Great synopsis for those just hired or who were confused to finally understand what most of us knew for a while. As a victim of this corrupt union, and it’s dealings with management so accurately chronicled in this piece, I implore the DOJ to open an investigation in this matter. The fact that a contract that we voted against was still rammed down our throats and has pushed us back below 2001 wages is unacceptable. APFA and AA are holding hands behind every door. Please do all the union members of APFA a big help and investigate this further. We are begging for help. I hope the dOJ investigates this! These people should be held accountable. What they did to us is wrong.it needs to be overturned and renegotiated! Thanks to all who are bringing this to light. We all are behind you! When you read it all, one can not miss how so much went on behind the backs of the employees who now work under a contract that was voted down. Then said contract was forced upon us even after it had gone to Binding arbitration and changed. We end up with almost exactly what we said no to. Now, to punish those who voted no they return the minimum 40 hours a month back. Too many back room meetings that go against what is right. GREED AT WORK HERE! please investigate and bring charges against those that deserve it! Thank you so much for your efforts to expose this travesty. I pray that justice is done for all affected by AA’s actions. If this is NOT investigated, then our government is as crooked as the APFA. This Union, should not be allowed to continue to operate. Ms. Gladding, should be personally fined! What would it take for an investigation to these business dealings, with so much at stake,,,, – how many livelihoods affected? ?,, at what costs? ?,, big business, collusion, nepotism– thank you Rock for a brilliant synopsis ,, can anything be done at this point?? thank you for your efforts for justice to be served for those of us wanting to create a world class airline treated like one,,,,morale is very low now. This should be investigated!! We , the flight attendants at AAL, should always be dealt with on a fair and transparent basis. Our contract was handled unfairly and in a non-transparent manner. What a surprise…it makes me ill.
With two imposed contracts in eleven years, I get the impression that APFA is run by American. 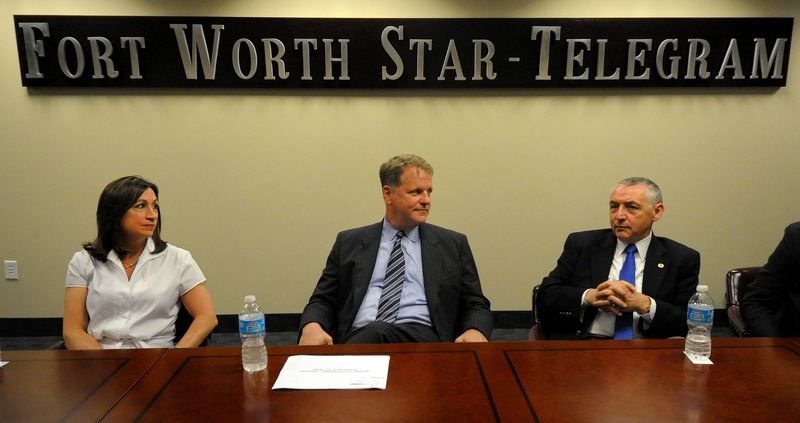 We KNOW that that is who runs the TWU…no surprise to us. Thank you Rock Salomon, my wife and I had voted for you and never had the doubt that you’d be the one to bring justice to our truly APFA organization. I’m glad you had the courage, persistence and tireless dedication to our Union to bring up all these facts. I encouraged you back then to continue to run for office and never tired your efforts, I hope that same dream and goal of becoming the APFA’s President still stands in you because myself and many of us will still support you here in DFW and I’m sure my former base colleagues at JFK still feel the same as we did before, among with the other bases where most of my flying colleagues had spread out to fly from. I believed 100% you were the person back then to lead this Union and that same feeling in our hearts still believes you can make a difference in our organization. Please consider to be our President this time, I’m sure you have proved to our members the things you’re capable of accomplishing, and maybe consider to have John Ward to join forces again, I believe you two will make a great difference in our organization for the years to come.